It’s finally here. The day you have been dreaming of since you were a little girl. Here are some tips to make sure you can have a no stress start to your big day! Make sure to eat a good breakfast! Chances are you won’t be getting to eat until dinner, and even then you will be so excited that you may not be able to! Something light like fruit, quiche, avocado toast or blueberry muffins are some ideas that are great for your whole bridal party while getting pampered and ready! Today is a big day. Take a second to mediate and relish in the moment. Click on the button to find a great meditative exercise video to use when you wake up! Dance! Have fun while getting ready. Put on a good playlist (anything 90’s is always a good idea) and jam out! Save the alcohol till later. Have fresh drinks that will energize you and your girls! 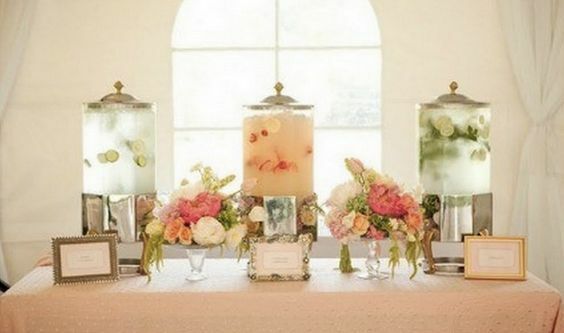 Plus how refreshing do these drinks look? Click the picture to find infused water recipes to try! No matter what you do, your day is going to be perfect because its YOUR day!